What a happy gingerbread man this is. Look at his smiley face and his lovely black bowtie - he looks very smart. Can you colour in the rest of the gingerbread men? You can give them hats, hair, clothes, happy or sad faces. These are just a few ideas - have fun! 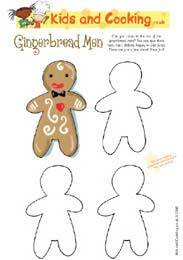 Why not Download the Gingerbread Men Colouring Picture right now and see what you can come up with! This activity is aimed at 3 to 7 year olds, it's a fun way to help children learn a little something about cooking in the kitchen, as well as building their creative skills.